Companies pay no state premium taxes on self-funded expenditures. This savings is around 5% – 3/5% depending on in which state the company operates. Endocarditis—This infection of the inner lining of the heart can be caused by bacteria that started in your mouth. Cardiovascular Disease—Heart disease as well as clogged arteries and even stroke can be traced back to oral bacteria. Low birth weight—Poor oral health has been linked to premature birth and low birth weight of newborns. Maintain a regular brushing/flossing routine—Brush and floss teeth twice daily to remove food and plaque from your teeth, and in between your teeth where bacteria thrive. Use the right toothbrush—When your bristles are mashed and bent, you aren’t using the best instrument for cleaning your teeth. Make sure to buy a new toothbrush every three months. If you have braces, get a toothbrush that can easily clean around the brackets on your teeth. Visit your dentist—Depending on your healthcare plan, visit your dentist for a check-up at least once a year. He/she will be able to look into that window to your body and keep your mouth clear of bacteria. Your dentist will also be able to alert you to problems they see as a possible warning sign to other health issues, like diabetes, that have a major impact on your overall health and healthcare costs. Eat a healthy diet—Staying away from sugary foods and drinks will prevent cavities and tooth decay from the acids produced when bacteria in your mouth comes in contact with sugar. Starches have a similar effect. Eating healthy will reduce your out of pocket costs of fillings, having decayed teeth pulled, and will keep you from the increased health costs of diabetes, obesity-related diseases, and other chronic conditions. We recently unveiled the latest findings from our 2017 Health Plan Survey. With data on 20,099 health plans sponsored by 11,221 employers, the UBA survey is nearly three times larger than the next two of the nation’s largest health plan benchmarking surveys combined. Here are the top trends at a glance. Sustained prevalence of and enrollment in lower-cost consumer-driven health plans (CDHPs) and health maintenance organization (HMO) plans kept rates lower. For yet another year, “grandmothered” employers continue to have the options they need to select cheaper plans (ACA-compliant community-rated plans versus pre-ACA composite/health-rated plans) depending on the health status of their groups. Increased out-of-network deductibles and out-of-pocket maximums, with greater increases for single coverage rather than family coverage, as well as prescription drug cost shifting, are among the plan design changes influencing premiums. UBA Partners leveraged their bargaining power. 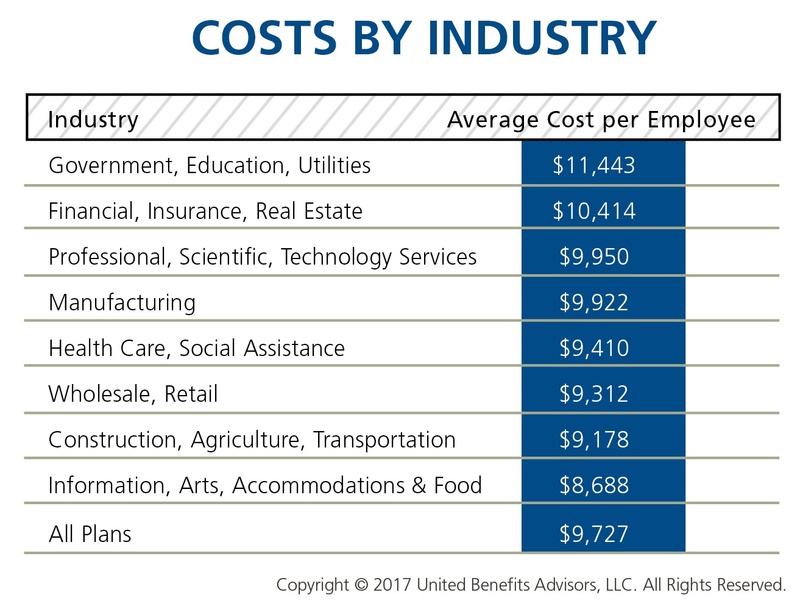 Retail, construction, and hospitality employees cost the least to cover; government employees (the historical cost leader) continue to cost among the most. As in 2016, plans in the Northeast cost the most and plans in the Central U.S. cost the least. Retail and construction employees contribute above average to their plans, so those employers bear even less of the already low costs in these industries, while government employers pass on the least cost to employees despite having the richest plans. Employee contributions are up, while employer contributions toward total costs remained nearly the same. Pharmacy benefits have even more tiers and coinsurance, shifting more prescription drug costs to employees. Consumer-driven health plans (CDHPs) cost less than average and enrollment is increasing. Most plans are at the gold or platinum metal level reflecting employers’ desire to keep coverage high. In the future, we expect this to change since it will be more difficult to meet the ACA metal level requirements and still keep rates in check. Slow, but steady: increase in self-funding, particularly for small groups. Rapidly emerging: increase of five-tier and six-tier prescription drug plans. Small employers, those with fewer than 100 employees, have a reputation for not offering health insurance benefits that are competitive with larger employers, but new survey data from UBA’s Health Plan Survey reveals they are keeping pace with the average employer and, in fact, doing a better job of containing costs. 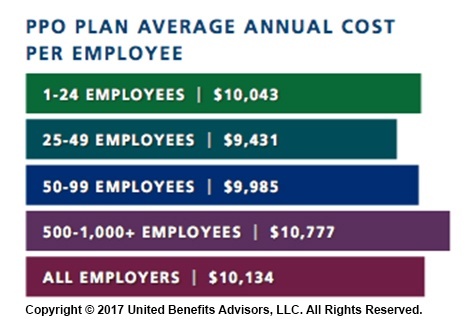 According to our new special report: “Small Businesses Keeping Pace with Nationwide Health Trends,” employees across all plan types pay an average of $3,378 toward annual health insurance benefits, with their employer picking up the rest of the total cost of $9,727. Among small groups, employees pay $3,557, with their employer picking up the balance of $9,474 – only a 5.3 percent difference. Think small businesses are cutting coverage to drive these bargains? Compared to the nations very largest groups, that may be true, but compared to average employers, small groups are highly competitive. It’s not surprising that 2017 stands to be the year many will have an experience to share using a Telemedicine or a Virtual Doctor service. With current market trends, government regulations, and changing economic demands, it’s fast becoming a more popular alternative to traditional healthcare visits. And, as healthcare costs continue to rise and there are more strategic pricing options and digital models available to users, the appeal for consumers, self-insured employers, health systems and health plans to jump on board is significant. Check out this short video and contact us to learn more! Form 1094-C is used in combination with Form 1095-C to determine employer shared responsibility penalties. It is often referred to as the “transmittal form” or “cover sheet.” IRS Form 1095-C will primarily be used to meet the Section 6056 reporting requirement, which relates to the employer shared responsibility/play or pay requirement. Information from Form 1095-C will also be used in determining whether an individual is eligible for a premium tax credit. Different real world situations will lead an employer to select any combination of boxes on Line 22, including leaving all four boxes blank. Practically speaking, only employers who met the requirements of using code 1A on the 1095-C, offered coverage to virtually all employees, or qualified for transition relief in 2015 and had a non-calendar year plan will check any of the boxes on Line 22. Notably, employers who do not use the federal poverty level safe harbor for affordability will never select Box A, and corresponding with that, will never use codes 1A or 1I on Line 14 of a 1095-C form. We knew most fully-insured groups did not have a Summary Plan Description (SPD) for their health and welfare plans, but we have been surprised by some of the other things that were missing. Here are the top five compliance surprises we found. COBRA Initial Notice. The initial notice is a core piece of compliance with the Consolidated Omnibus Budget and Reconciliation Act (COBRA) and we have been very surprised by how many clients are not distributing this notice. Our clients using a third-party administrator (TPA), or self-administering COBRA, are doing a good job of sending out the required letters after qualifying events. However, we have found that many clients are not distributing the required COBRA initial notice to new enrollees. The DOL has recently updated the COBRA model notices with expiration dates of December 31, 2019. We are trying to get our clients to update their notices and, if they haven’t consistently distributed the initial notice to all participants, to send it out to everyone now and document how it was sent and to whom. 30 days after any change in the creditability status of the prescription drug plan. ACA Notice of Exchange Rights. The Patient Protection and Affordable Care Act (ACA) required that, starting in September 2013, all employers subject to the Fair Labor Standards Act (FLSA) distribute written notices to all employees regarding the state exchanges, eligibility for coverage through the employer, and whether the coverage was qualifying coverage. This notice was to be given to all employees at that time and to all new hires within 14 days of their date of hire. We have found many groups have not included this notice in the information they routinely give to new hires. The DOL has acknowledged that there are no penalties for not distributing the notice, but since it is so easy to comply, why take the chance in case of an audit? USERRA Notices. The Uniformed Services Employment and Reemployment Rights Act (USERRA) protects the job rights of individuals who voluntarily or involuntarily leave employment for military service or service in the National Disaster Medical System. USERRA also prohibits employers from discriminating against past and present members of the uniformed services. Employers are required to provide a notice of the rights, benefits and obligations under USERRA. Many employers meet the obligation by posting the DOL’s “Your Rights Under USERRA” poster, or including text in their employee handbook. However, even though USERRA has been around since 1994, we are finding many employers are not providing this information. Section 79. Internal Revenue Code Section 79 provides regulations for the taxation of employer-provided life insurance. This code has been around since 1964, and while there have been some changes, the basics have been in place for many years. Despite the length of time it has been in place, we have found a number of groups that are not calculating the imputed income. In essence, if an employer provides more than $50,000 in life insurance, then the employee should be paying tax on the excess coverage based on the IRS’s age rated table 2-2. With many employers outsourcing their payroll or using software programs for payroll, calculating the imputed income usually only takes a couple of mouse clicks. However, we have been surprised by how many employers are not complying with this part of the Internal Revenue Code, and are therefore putting their employees’ beneficiaries at risk. There have been other surprises through this process, but these are a few of the more striking examples. The feedback we received from our compliance assessments has been overwhelmingly positive. Groups don’t always like to change their processes, but they do appreciate knowing what needs to be done. Many employers benchmark their health plan against carrier provided national data. While that is a good place to start, regional cost averages vary, making it essential to benchmark both nationally and regionally—as well as state by state. For example, a significant difference exists between the cost to insure an employee in the Northeast versus the Central U.S.—plans in the Northeast continue to cost the most since they typically have lower deductibles, contain more state-mandated benefits, and feature higher in-network coinsurance, among other factors. Drilling down even more, comparing yourself to your industry peers can tell a very different story. Consider a manufacturing plant in Georgia that offers a PPO. Its premium cost for single coverage is $507 per month. Compare this with the benchmarks for all plans and you can see that it is $2 per month less than the national average. When compared with other PPOs in the Southeast region, this employer’s cost is actually $2 more than the average. 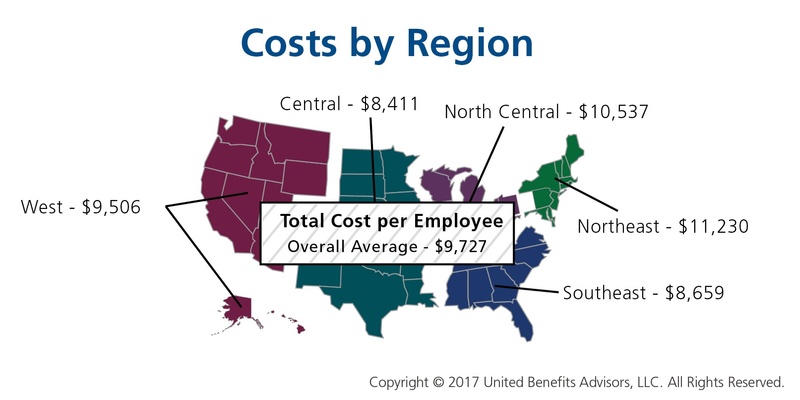 This employer’s cost appears to be higher or lower compared with national and regional benchmarks, depending on which benchmark is used. 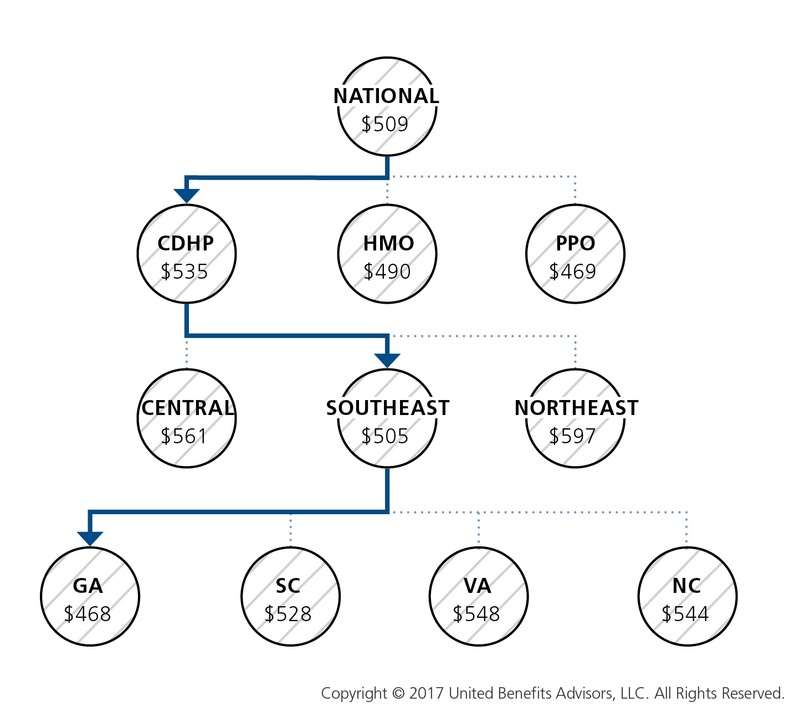 Yet this employer’s cost is actually higher than its closest peers’ costs when using the state-specific benchmark, which in Georgia is $468. Bottom line, this employer’s monthly single premium is actually $39 more than its competitors in the state.